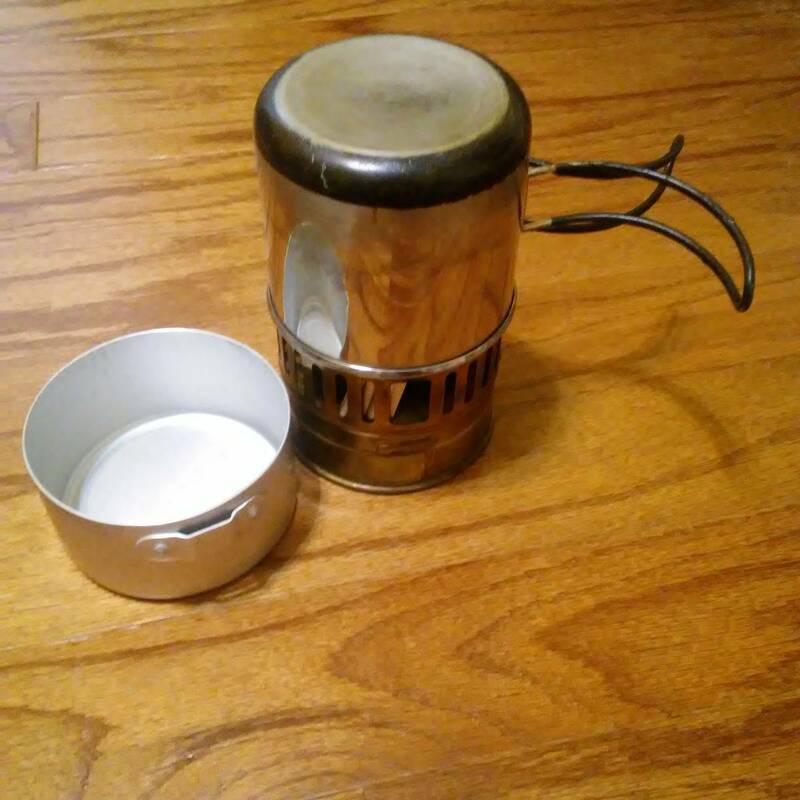 I have a Pathfinder stainless canteen from Self Reliance Outfitters and love it. Being stainless, you can use it to boil if needed. Nice wide mouth and holds a lot of water. Not ideal for carry on a belt due to the size and weight vs. GI or Nalgene versions but it works well on a pack or with a shoulder strap and is one of my favorite pieces of backpacking kit. I've gone to milk white nalgenes with a nesting stainless cup. That and platypus bladders. Those Olicamp stainless cups work well with SVEA 123 stoves and the folding Esbit stoves too. I have a titanium cup for when weight matters, and I've also got an Al one I don't use much. I backpacked all my life until 2007. At that point in time Naglene bottles were already old fashioned. Everyone was using bladdersand had been for a long time. You may find some good info on Backpacker Magazines website or another similar source. You still rocking a SVEA123? That's so old school and so cool! Beautiful brass construction and when fully fired up, sounds like a blow torch. I bust mine out, purchased in 1978, a couple of times each summer and love hearing it flame away. Keeping it real! Started using bladders in late 70s with a prized VN surplus 5 qt bladder, long before CamelBak craze. And made fun of the nalgene craze when it hit. Problem with the nalgenes is they work, are handy, dishwasher safe, and the white ones are largely indestructible. And are cheap enough to have several. If I backpack, I use one nalgene and refill from multiple platypus bladders to distribute the weight. And they (platypus) take zero space when empty. When I hunt it's a platypus in the day pack. But for all around camp/survival usage, hard to beat a white nalgene and cup. Scout troop experience has shown the clear ones can break, especially when cold. Metal ones dent and are inefficient to boil water in. I can freeze a white nalgene solid, then throw it like a football and it won't break. It will distort when frozen, then go right back to it's normal shape. I can see the tactical advantages of a CamelBak, but for most of what I do, I like a canteenish approach. Occasionally yeah. Mine is the 123R version and may have been purchased originally in the 70's. I got it about 20 years ago missing the windscreen/stand and cook pot as a package deal with an MSR Whisperlite which has since been sold. Even had to buy replacement guts for the 123, just liked it better. In most ways the Olicamp is better than the SVEA pot I eventually acquired. I use the white Nalgenes also and/or hi viz orange and green ones made from the same material they offered as a retro anniversary thing a few years back. I usually put camelbaks up from November to March due to the line and/or valve freezing once the temperature hits around 20 when stopped. When it hits single digits it is a pain to keep it thawed even when moving. Why I also switch to chemical or heat instead of filters this time of year. If I am going to be eating lunch/dinner for sure I usually bring a pint size Nalgene one along to drink out of since it is handier. I bought about a dozen 3 liter Platypus bladders at a milsurp shop several years back for a buck a piece. I don't think they knew what they were and I wasn't sure for months after I saw them laying on a shelf. No cap assembly and no printed markings....logos or graduations. After I bought one in a hiking store I started noticing similarities between it and the surplus shop ones. Finally I happened to notice the Cascade Designs logo molded in to the seam on my hiking shop pick up and next time in the surplus shop I found the same molded logo on the bladders in the pile. Last edited by jsbhike; 01-09-19 at 17:03.